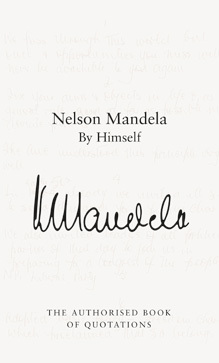 March 24, 2011 – The Nelson Mandela Centre of Memory is pleased to announce the upcoming launch of the first wholly accurate, fully referenced and authorised record of Nelson Mandela’s most inspiring and historically important quotations. Nelson Mandela By Himself: The Authorised Book of Quotations will be launched ahead of Mandela Day and Nelson Mandela’s 93rd birthday. This collection - gathered from privileged authorised access to Mandela’s vast personal archive of private papers, speeches, correspondence and audio recordings - features more than 2 000 quotations spanning over 60 years. The inspirational quotations are organised into over 300 categories for easy reference, including such aspects as what defines greatness in ‘Character’, ‘Courage’ and ‘Optimism’, while we learn from him the essence of democracy, freedom and struggle in the categories such as ‘Democracy’, ‘History’, ‘Racism’, ‘Reconciliation’ and ‘Unity’.